Disclaimer: The Burson Play was sent to us in exchange for our honest opinion in this review. Burson Audio is not an affiliate or advertiser on Headfonics and the unit does not have to be returned. Many thanks to Burson for giving us this opportunity. It has been almost seven years since we did our first Burson product review, the HA-160D in 2011. Though it was reviewed by Kyle back then I had the unit myself and loved it. Of course, the time has moved on and Burson has really pushed their amplification philosophy onwards and upwards since then. 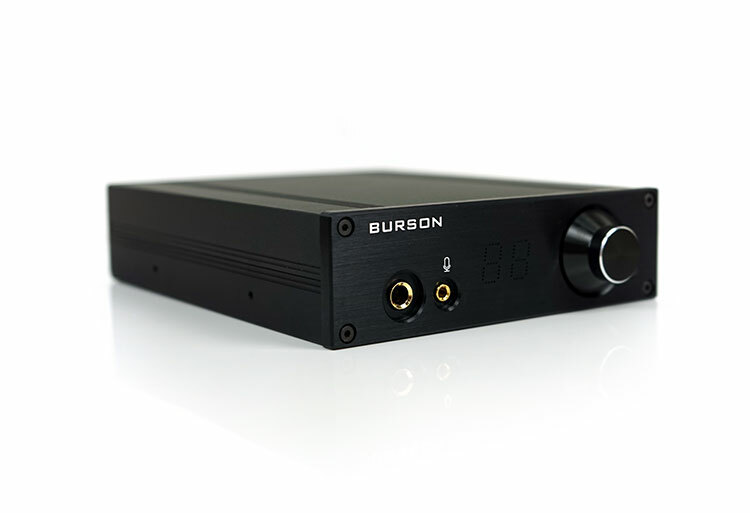 In the last few years, Burson has developed a far more open approach to discreet Class A amplifier design and in some ways, they now have two key approaches to the market. Yes, they still make fully complete amps and the Play can be considered one of them. However, they also started pushing their own line of discreet Opamps which has its own identity from their Supreme Sound division collaboration on the Lycan a few years ago. As a result, the Play is sort of a meeting of the minds in terms of amp design and their growing Opamp development. The Play starts at $299 which is competitive. However, you have the opportunity to really go for it with some of their best Opamps on offer which can push the price up to $549. The choice is yours. The clue is in the name, Play. This is a DAC/Amp with a lot of the hallmarks of the Burson amp building legacy. However, the pitch of this amp is towards the gaming community. Sporting a design that can dual as a standalone component or slot into a PC tower, the Play is being pitched as offering a clear upgrade to gamers on audio quality as well as audiophiles who want a competitively price DAC/Amp for their system. For audiophiles who like to tinker Burson are also pitching the Play as a versatile discreet Class A amp with swappable opamp capability. Each unit has 5 ‘rollable opamps from the base config of NE5532 X 3, NE5543 X 2, right up to the $549 TOTL version with their V6 line of opamps, Classic and Dual. A choice is a powerful thing and plenty of audiophiles will appreciate having the ability to configure the play based on their budget and preferences. Beyond that, the Play can double up as a pre-amp, a dedicated DAC and deliver a very powerful 2W single-ended output which will drive most headphones out there today. To top it off, the PLay’s final pitch to gamers is the inclusion of a mic input for those who like to really immerse themselves in online gaming communities. The Play is robust and industrial looking in part with a front detachable panel that is traditional Burson in aesthetics. It measures 210mm x 145mm x 45mm and around 2kg so it is not insignificant despite its relatively small form factor. This is a very solid aluminum chassis cut in a classic rectangular shape with screw on plates to the front and rear. The finish is all in black save the white and gold accents of the brand logo, jack ports, and mic icon to the front and functional labeling and unit type to the rear. The top panel has two columns of venting holes running on the far left and right. Now there is a reason for that robust build. The Play is actually designed to either sit comfortably as an audiophile desktop style DAC/Amp on its own or slot into a 5.25″ PC bay and securely fasten to become part of your gaming rig. Both front and rear are designed for easy access for volume, inputs, and outputs if part of your computer tower. 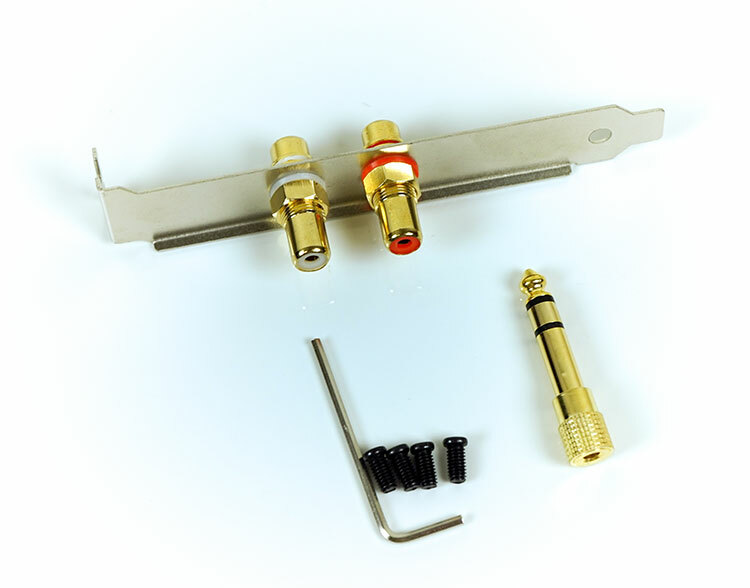 Burson has actually supplied a number of accessories to complete the PC integration job including a rear dual RCA tray adapter and a set of fastening screws that slide into the side of the Burson play to lock it tight. If you have a matching black tower this is going to look the business. Front and center is a simple but large and clear array of blue LED diodes for volume display. The diodes are just behind the metal front panel which has a series of holes to allow two 0-9 LED permutations to cover the 99-digital step volume range of the Play. It is not as fancy as the Pro-Ject Audio Pre Box S2 Digital but then again, the Play does not have any tweaking options such as filters and distortion settings so volume is all that is required for the display. There are 2 inputs on the Play. To the front, you have a mono 3.5mm mic input and to the rear a single digital USB XMOS XU-208 chip input stage. 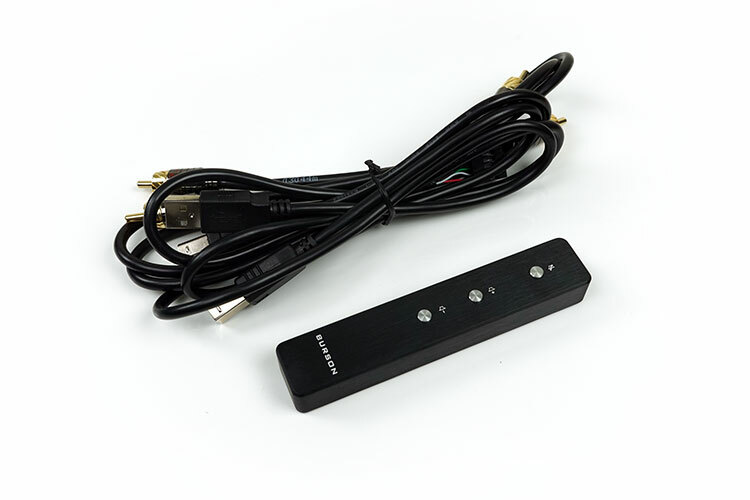 The analog mic input is connected to an HS-100B analog-to-digital converter with sampling rates of up to 48k/44.1KHz. Volume control on the front has the traditional Burson knob, however, this is digital as opposed to analog. It also doubles as a pre-amp volume control in case you are using another analog amp in the chain. To the rear, you have a set of dual RCA pre-outs rated at 30Ω with an approximate 2v-2.15v output rating which should pair seamlessly with dedicated analog amps. To the front, you have a 6.35mm gold-plated single-ended jack output rated at a beastly 2W into 16Ω. The power unit is a switching DC 12V 5A and comes with its own power brick as well as 4-pin socket connector for hooking it up directly to a PC power supply when integrated into a tower. Noise suppression from any PC connection is dealt with by a dedicated LT1085 low-noise regulator. A simple but easily reached on-off switch in red is right beside both power sockets. You have two methods of controlling the settings on the Play, old school reaches and pokes with slight breathy coach potato wheeze and a dandy little mini-tank of a remote control. Now if you opted to buy the Play Basic package, which is Burson’s entry-level version, you will not get the remote control. You will likely have to buy it as an optional extra. I would advise getting it. It is not an overly complicated device with only 3 types of controls and all volume related; mute, volume up, and volume down. However, it is really well built and will take an absolute beating and still work just fine. Well worth upgrading to. If you elected to the V5i package or higher then I have to say the accessories packed with the Play are excellent quality. Not just the value, but the usefulness. You get an external DC power supply and that robust little remote control that I have now nicknamed Dr. Steel Finger! Aside from that, you get a USB cable, a quarter jack adapter and a set of nicely finished interconnects for the pre-amp out duties. These are not your usual Radio Shack $2 IC throwaways either. These are some good material thrown into these including some very attractive silver Pailics RCA jacks on either side. For those wishing to use with their PC you also get a tray adapter, hex key and a set of screws to fasten everything inside your compatible tower. The play is back with a single ES9018K2M chip getting the clock from the onboard 100 MHz oscillators. This is 2-channel chip primarily used in mobile solutions such as DAPs like the Cayin N5ii. It is not the most modern chip out there right now but it is still more than capable and does help keep the bill of materials for the Play competitive. Traditionally the ES9018 range will provide and very clean and neutral presentation, however, some amp combinations can often exhibit glare using this implementation. You will be pleased to hear that the discreet design and opamps rolled out with the Play make that concern utterly moot. Decoding rates are solid at 32BIT/384KHz and up to DSD256 so you should have zero issues with any digital signal you throw at it via its USB connection. For the record, the Play uses an XMOS USB XU-208 chip stage for digital input. This is where it gets interesting. The basic numbers are fairly fixed with the output rating of 2W at 16Ω and 1W at 32Ω under 1KHz loads. That is pretty impressive for a single-ended mid-fi rack and should be more than enough for almost any dynamic headphone and quite a lot of planars in the market today. 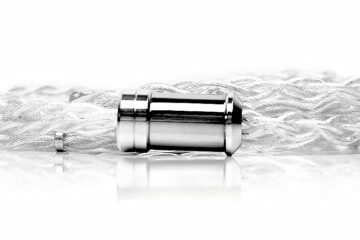 What you do need to be aware of is the output impedance level which is rated at 8Ω. This, combined with the hefty power rating makes this more of a headphone amp. You will get noise with IEMs; the noise floor is simply too high for efficient low impedance gear. You will also get a low-Z skew on your impedance response due to that high impedance output rating. Chances are anything below 30Ω might sound a bit ‘off’ on the Play. The sound of the Play, however, is not fixed due to the ability to swap out those opamps. 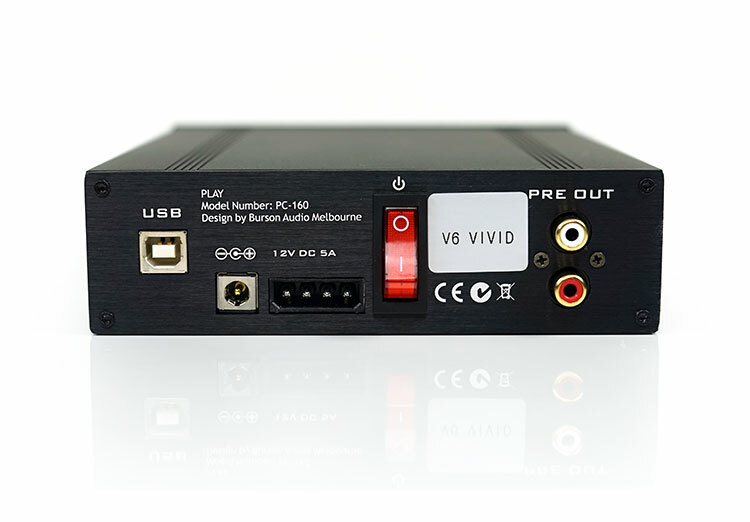 Our stock unit is the Vivid which comes with three V6-Vivid-Dual opamps and two V6-Vivid-Single opamps. We also received enough opamps to change it to the TOTL Classic sound with an additional set of Classic dual and single opamps. About halfway through the review process we also received a newer version of the Play BASIC which was optimized for more sensitive headgear but also included the entry-level opamp chips which are three TI NE5532 and two TI NE5543. I can tell you right now there is a big difference in the two setups tonally and in terms of noise levels for IEMs. I am told the new v2 of the Play is the defacto model they are shipping as of now so I would highly recommend the Classic combination for the best mix of noise and tonal refinement. The Play uses only a pretty powerful Class A transistor amp design with no capacitors in the signal path. There are no integrated chipsets in the Play for these two combinations. Both the V6 and V5 opamps are fully discrete. Hi Alex, having not heard the Yulong I could not say if this is an upgrade or not. I can say the V6 is the smoothest configuration for amp matching. From the pics the Yulong is quite feature rich with both single-ended and balanced outputs. The Burson does not have that, just single ended with USB input and one RCA pre out. It will be fine for your setup but not sure if an upgrade. PC- Yulong DA8 II – Adam A3x + Grado 325. Do u think Burson Audio Play with V6 will make any difference? Or I can integrate Burson Play into my system somehow?I should look at something else(different price category)? We are the review site that keeps on giving lol! If it helps the Burson Fun headphone also does mute for either headphone or speaker. I am curious about this one. Wanting a solution on a smaller desk for both headphones and powered speakers. When headphones are plugged in do the speakers mute? or is it an all or nothing kind of deal? I am currently using an idsd nano black and I love the fact I can turn down my headphones to zero but the line out is fixed to my speakers. Given this is a Pre, if both the headphone and speakers output at the same time I would also assume both are obviously effected by volume control. Hang on I think I answered half of my own question… DOH! I prefer the Vivid opamps with the AEON open and the Classics with the closed. No issues on power, the Play can drive them both. 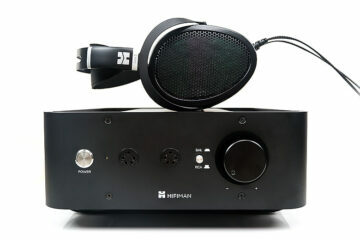 how does it pair with the mr speakers aeon? theres a picture but nothing about aeon mentioned? I am sorry we do not have an IrDAC2 to compare and comment on. Thank you for your reply, but I just want a good dac. I use it for my speaker set up on my desk. Changing the opamps is fun, but I need to know how the Dac of the Burson is compared with the Irdac2. I hope you will answer this final question. Yes the tonal shaping from the opamps will be the same. In fact, Burson do the same opamp swapping with their Bang power amp which I recommend you look at also for speakers. If you are after a new DAC and its not the DAC in the Play you want then better to buy the Bang and the classic opamps. Well there is the Syba Sonic at he entry level that looks interesting, then the Creative E5 mid-ranger but it may not have he power you are looking for. Mayflower have an 02 adaptation with mic called the 02. Not tested any except the E5 and thought the play batter. Thanks for the reply. Do you have any other recommendations. It seems the market is limited if I want the ease and convenience of a forward facing microphone port on a DAC/AMP combo. I know there is Sennheiser’s game oriented DAC/AMP combo (GSX 1000), but I think I’ve read it may have a hard time driving headphones. The HD 58X Jubilees have a 150 impedance. I believe that is the top range of the GSX 1000’s. Then there is the Mayfield Arch. I am just starting to potentially get into wanting nicer setups and headphones. Yup should work well with the Senns. The Burson has plenty of power to drive them and if your tower is modular you can screw the Play right into your rig. Audio noob, here. I have a question for you because I don’t really grasp the output/power ratings, etc. I am looking for a AMP/DAC combo for my desktop PC setup. I mostly game, and watch movies and chat on Discord. My budget is $300 and under (give or take). Would these be a good fit for the Massdrop x Sennheiser HD 58X Jubilee headphones? I am going to move away from the cheap PC gamer headphones and start out with this entry level Sennheiser set.